- Review knowledge of climatic change and variability, due both to natural and anthropogenic causes. 1977: "The executive committee of the WMO has specifically asked this conference to recommend whether a conference at the ministerial level should be convened to take necessary international actions." No action to lobby govts. 1977: WMO "...increased the amount of CO2 in the atmosphere by about 15% during the last century and it is at present increasing by about 0.4% per year. It is likely that an increase will continue in the future... it appears plausible that an increased amount of CO2 in the atmosphere can contribute to a gradual warming of the lower atmosphere, especially at high latitudes". 1977: WMOs Conclusions and recommendations": "
- The WCP... requires leadership and co-ordination among international bodies and close collaboration among nations". - There is an immediate need for nations to utilize existing knowledge of climate and climatic variation in the planning for social and economic development". 1979: Geneva - The First World Climate Conference (WCC) takes place. WCC led to the World Climate Programme and the World Climate Research Programme. 1988: WCC also led to the formation of the Intergovernmental Panel on Climate Change (IPCC) by WMO and United Nations Environmental Programme (UNEP). 1990: Geneva, Second Climate Conference - step towards a Global Climate Treaty. IPCC first assessment report presented. Global Climate Observing System (GCOS) established. 1991: First meeting of the Intergovernmental Negotiating Committee (INC). 1992: Governments of countries joined at International Treaty, the UNFCCC, to plan how to lower global warming and deal with climate change impacts. 1992: Rio de Janeiro - Earth Summit (UN Conference on Environment and Development). 1992: At Earth Summit, UNFCC + two Rio Conventions (UNCDBD & UNCCD) adopted. 1995: Berlin - COP 1. 1995: Governments of countries realised UNFCCC was inadequate in addressing emission reduction. A stronger plan was formulated in the Kyoto Protocol. 2001: Marrakesh - COP 7, IPCC's third report (AR3) + Bonn Agreements + Marrakesh Accords adopted. - Rules for implementation of Kyoto Protocol. - Setting up new funding and planning instruments for adaptation. - Establishing a technology transfer framework. 2005: Montreal - First Meeting of the Parties to the Kyoto Protocol (MOP 1). Phase 2 KP - Ad Hoc Working Group on Further Commitments for Annex 1 Parties under the Kyoto Protocol (AWG-KP). - Make informed decisions on practical adaptation actions and measures to respond to climate change on a sound scientific, technical and socio-economic basis, taking into account current and future climate change and variability. Partners make Pledges, may be private sector, govt, intergovt or civil society. Voluntary not legally enforceable or binding. To date over 200 partners - organisations, institutions, businesses and communities. 2007: Bali - COP 13, IPCC's 4th Assessment Report (AR4) wake-up call to the world of the global crisis of climate change, global warming and its impacts. - "The average temperature of the earth's surface has risen by 0.74°C since the late 1800s. It is expected to go up another 1.8°C to 4°C by the year 2100 if no action is taken. That's a fast and intense change in geological time. Even if it "only" gets another 1.8°C hotter, it would be a larger increase in temperature than any century-long trend in the last 10,000 years." 2008-2012: Kyoto's Protocol first commitment period. - Sets binding emission reduction targets for 37 industrialized countries and the European community. - Targets add up to an average five per cent emissions reduction compared to 1990 levels over the five-year period 2008 to 2012. 2009: Geneva - World Climate Conference 3, focusing on climate predications and its impacts on users such as agri-sector, water, health, tourism, UM Millennium Goals, Hyogo Framework Action on Disaster and Risk Reduction, etc. 2009: COP 15: Copenhagen or 'Hope-nhagen' - Copenhagen Accord drafted. Countries later submitted emissions reductions pledges or mitigation action pledges. Non-binding pledges. 2010: Governments agree emissions need to be reduced so that global temperature increases are limited to below 2 degrees C.
2010: Cancun - COP 16. Cancun Agreements drafted and largely accepted, flow-over to COP 17. 2011: Durban - COP 17, let's wait and see if more hot-air presides. Paper promises in the form of policy and legislative mechanisms are good and well; but as experience has taught us, paper promises are 90% of the time just that, lovely forms of references when monitoring a state's adherence to international agreements or even local law, but the lack of monitoring and enforcement barely happens and if at all with 'sweetheart-slap-on-the-wrist' penalisation of polluters. So when I refer to action I mean tangible measurable ones on the changes at the very sites of impact, be they biophysical or social. This not so far-fetched revelation of "what people say and do are often divorced", a crude issue of public image and spinning versus actual behaviour, is what should guide our milestone monitoring of climate change action, from grand global players of the greatest polluters versus benign climate change victim nations. At the sovereign nation level monitoring should encompass the internal disparities of the unfair impacts of climate change on the poor who by far have the smallest carbon footprint but will come to bear the brunt of harsh climate change impacts from vicious weather cycles to survival access to drinking water, food and shelter. 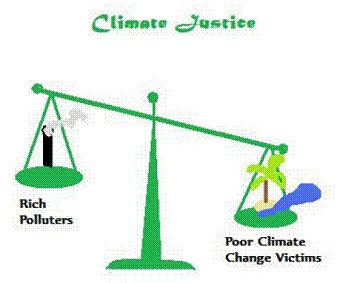 Action should be built on justice, equity and stringent law enforcement on polluters across the globe!